Plot: A tracker must help an FBI agent solve a crime on a Native American reserve. A film of raw power and emotion Wind River completes a trio of films from Sheridan that marks him out as a fascinating modern filmmaker with harks back to the grit and edge of ‘70s thrillers. 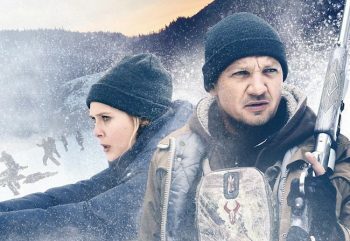 Despite it’s stars (Jeremy Renner and Elizabeth Olsen) Wind River is not The Avenger’s Hawkeye and Scarlet Witch investigating a murder. Although, Marvel, we’d watch that. Instead Wind River is from writer, and here also director, Taylor Sheridan, the man who gave us the stunning Sicario and brilliant Hell Or High Water. As with those films there is a sense of nihilistic Western lurking beneath the icy surface of Wind River but more than anything a captivating, bleak and honest – the film is loosely based on real events – portrayal of a badland where law and order are murky at best. On a Native American Reservation a young girl is found dead by veteran tracker Corey (Jeremy Renner). Haunted by a tragedy that befell his daughter Corey agrees to help FBI agent Banner (Elizabeth Olsen) hunt down those responsible for the girl’s death. What they discover is a land which is fraught with hopeless people and grief is to be found at almost every rundown shack door. As with Sheridan’s previous efforts there is something immediately oppressive about Wind River. The stark, blinding vistas lend to the sense of danger and emptiness around every corner. On the surface a crime drama there is something more satisfying here than a whodunit. The world of Wind River is haunting, the environment has taken its toll on all the inhabitants, some of them physically almost all of them mentally. This is pure cinema, where men try desperately to avoid confronting their inner demons and emotions. Watching them fail at both is one of the most heartbreaking things you will witness in film in recent memory. Meanwhile, despite brutally tragic statistic regarding Native American Women at the film’s close, the female of the species is braver, fiercer and tougher than the male. This is echoes throughout but proudly when dealing with the victim that sets of the film’s events. In particular Olsen’s fish out of water is reminiscent of Clarice Starling from The Silence Of The Lambs. Fragile one minute, determined and resolute in the face of adversity the next. It’s another role for Olsen that reminds you why she is one of Hollywood’s best kept secrets. It is to her credit, and our good fortune, that Olsen has only ever really been seduced to the big time for a second tier character in The Avengers films. Because in these braver, smaller films she is able to shine in characters that have levels and dimensions beyond that of a spell-casting witch. Opposite her Renner reminds us why, again when outside of his superhero alter ego, he is a huge talent. His Corey is monosyllabic, a true cowboy drifting through this life carrying a grief he cannot escape. It is that grief that drives him and the film’s breathless sense of mourning. It’s a classic example of an actor doing less and making his performance indelible as as result.